Hi All! I’m excited to share my latest DIY. I just finished (finally) refinishing an old formica cabinet at my parents house (that I had left hanging for a little while). First, I apologize for the quality of the before pictures. I started this project in February, before I started blogging — yes, it’s only been a little over 2 months since I started the site — so I wasn’t planning on anyone seeing the pictures but me, so the photos were taken with my crappy cell phone. But you definitely get the idea how horribly ugly that cabinet was; another remnant of the 80’s. These are the same cabinets that are currently in the kitchen (ugh!) only this single one is on the other side of the kitchen wall and sits in the dining room. I was planning on ripping it out, but then I got the idea to give it a makeover. I wasn’t quite sure the best way to refinish formica. I googled it, but didn’t find any really good ideas. So I came up with my own plan. I didn’t know if it would work or how it would turn out, but I figured if it didn’t turn out well, I could still rip the cabinet out later. Well, now the plan is to keep my DIY refinished formica cabinet and Mom & Dad have a new cabinet to store their china. So, with no further ado, on with the tutorial. There are three things I did to refinish the ugly formica cabinet: 1) paint, 2) add trim to the doors, and 3) add crown molding. Dissolve the unsanded grout in about a tablespoon of water. Once dissolved, mix the grout mixture into 1 cup of paint. The paint will start to thicken to an almost pudding consistency. If you prefer working with a thinner formula, mix in additional water a tablespoon at a time to preferred consistency. Before you start painting, make sure to thoroughly clean your cabinet. I used soap and water, but if your cabinet is in the kitchen, I’d recommend using a degreaser too. Next, I removed the doors and using a foam brush, gave the doors and cabinet three coats of my homemade chalk paint. I had planned on using a roller, but the paint was too thick for the roller, so I went for the foam brushed. In between coats, I gave everything a very light sanding. This helps even out any unevenness or brush marks (which I didn’t really have) from the painting. The paint I used was semigloss, but adding the unsanded grout ends up dulling it down to a more flat finish. The finish looked fine, but I wanted something with more sheen. So I did a fourth coat with the pure paint (with Floetrol the mixed in, of course). For the new trim, I used small wooden planks that I purchased from the craft wood section at Home Depot. 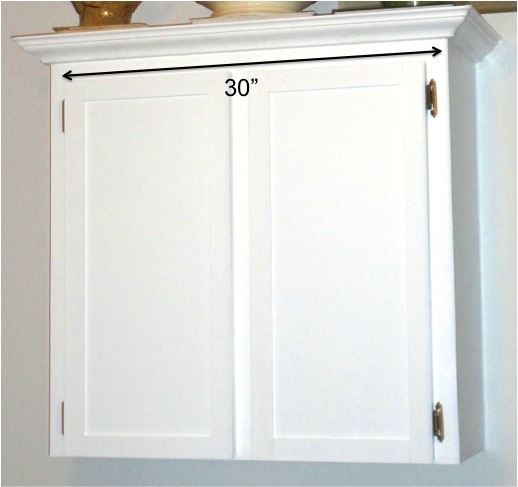 I cut these down to the length of the cabinet doors, which was 27.5″, and the door width minus the 3-inches (1.5″ for each length-wise piece). This turned out to be 9.5 inches. The trim and crown molding was painted prior to installation. Again, I did three coats of the chalk paint mixture and a final coat with the semi-gloss. And here’s a really helpful tip. Some of the paint seemed to get on the bottom side of the trim pieces. I didn’t realize this until I was all finished painting them. This prevented the trim pieces from laying completely flat on the doors, so I had to sand off the paint that got underneath. 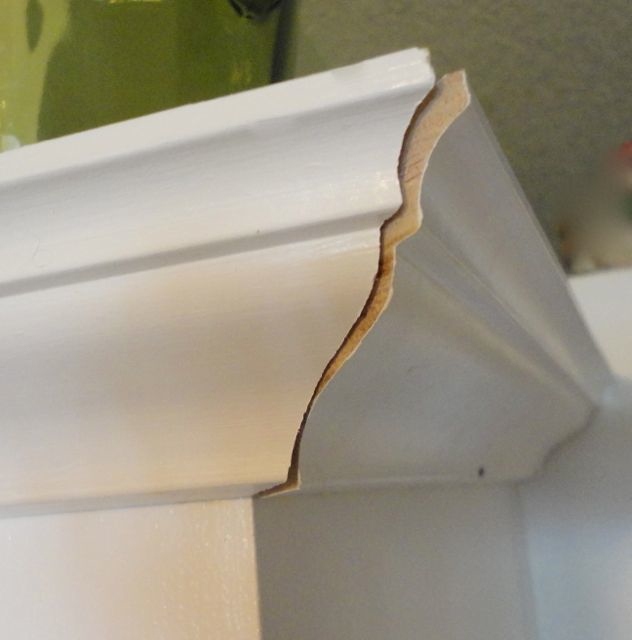 You can avoid this by simply wiping off the bottom of the trim pieces before they dry. Lesson learned. Once the trim and the doors were completely dry, I adhered the trim to the doors simply using wood glue. I layed out each door on the floor, adhered the trim pieces and placed every heavy object I could find on top to make sure they adhered well. And here’s another tip. Since the paint was only about 24 hours dry, I was concerned about it still sticking to the heavy books I layer on top. So I put a sheet of wax paper between the doors with adhered trim and the heavy stuff. Had no sticking problems. Next, I moved on to the crown molding. I borrowed my brother’s miter for this. I had mitered quarter round molding quite a few years ago for my first home and it was a piece of cake. Crown molding, on the other hand, has some challenges. 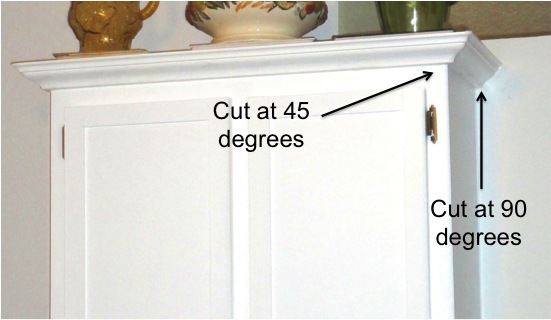 When you miter crown molding, you need to turn the molding upside down so that the cut is made to the correct length. It was a little confusing to me at first, but I worked it out. With the miter, I cut each end of the front piece 30 inches at a 45 degree angle. On the side pieces, only one side is cut at 45 degrees. The other side is 90 degrees. When cutting molding on a miter, make sure to press the edges firmly to the back and bottom of your guides (careful with your fingers) and remember you are cutting upside down. 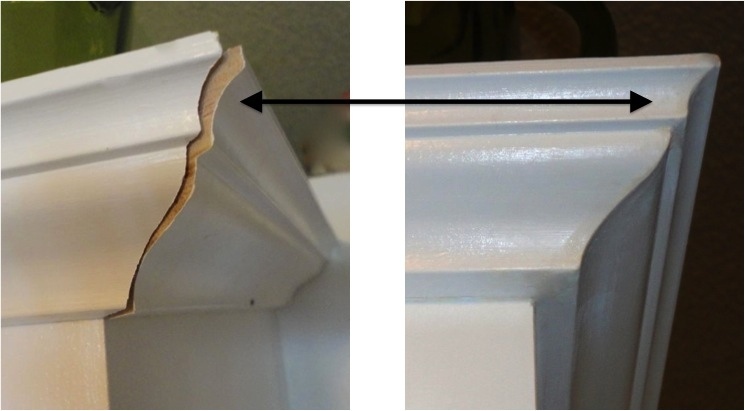 To install the crown molding, first apply a bead of wood glue along the length of the molding, then attach with nails. I don’t have a nail gun, so I had to install the crown molding the old fashioned way, with a hammer. It was a bit challenging to get it straight, but I had a friend help hold it in place while I hammered. Remember to use a level to make sure it’s straight. I did end up having a problem where the corners meet. I couldn’t get the corners to lay completely flush. All the home improvement videos make it look so easy, but it didn’t turn out that way for me. So I MacGyvered a solution. I applied wood glue to the corners and clamped them. I didn’t have real clamps. So I used a brand new cable jumper that I had in my car trunk. I padded the corners with pretty thick paper towels so the clamps didn’t dent the wood. It worked like a charm. My corners were aligned. Next, I filled the gaps with joint compound, just using my fingers. Here’s a tip: wet your finger before smoothing the compound. You’ll get a really clean line. I also used the joint compound to cover the nail holes. I did have to sand down the joint compound from the corners because I made a bit of a mess. I did not use any protective finish on this cabinet simply because it rarely gets any use. But when I do the kitchen cabinets, I will be sure to use one. Quite a difference. And now that I know what I’m doing, my plan is to refinish all the kitchen cabinets like this. I’ll keep you posted on that project. And check out my Shabby Chic Furniture Makeover Using Krylon Looking Glass Paint. Amazing job! They look FANTASTIC and so professional. 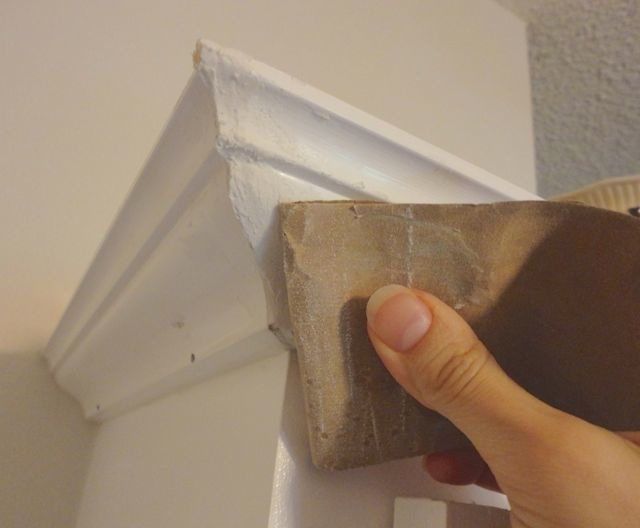 Great tutorial, especially showing the tips for the crown molding corners. Thank you so much Audra! I really don’t know how the professionals get those corners so perfect on their first shot. I left the project hanging for a little while because I wasn’t sure how to fix them. Glad I finally came up with an answer. Great tutorial and great job. I need to learn to use a miter correctly. A little shy about taking the first step but the worst thing that could happen was have to make another cut. Oh well!! Thanks for the blog. I have wondered for a long time what to do with my formica plastic looking kitchen cabinets. Thanks so much for the precise tutorial. There is a way to have mitered molding piece together, I think it’s called coping. I’ve never tried that though. Wow, this is a really great post with a ton of useful tips! I’m definitely pinning it. I am also going to pick up some Floetrol to try. I just started painting all the walls, doors and trim on my main level. I’ve been using paintable caulk on the molding and it really makes a difference. Thank you very much. I’m glad it’s helpful. I LOVE Floetrol. Will never paint with out it. It makes such a difference. Love the paintable caulk too! I first tried it when I was painting trim a while back and really no brush marks. But invest in a high quality brush too. Could this be used on Formica counters? Hi Peggy, I suppose you can use it on counters, but I would imagine you would need a sealer that is much more durable than polycrylic. I read that EnviroTex Lite Pour-On Finish makes a good heavy duty clear sealer for counter tops and so does using a clear resin. 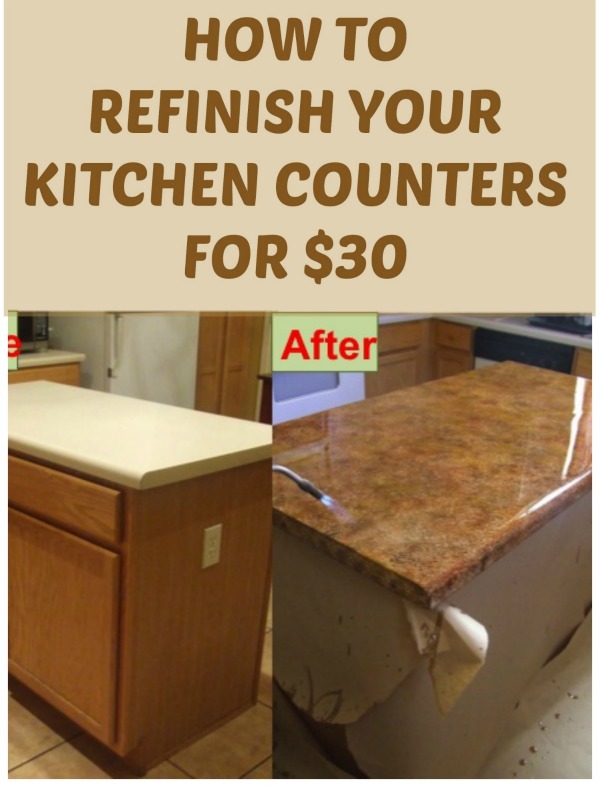 I’m planning on doing the kitchen counter tops, which are also formica) in a faux granite (like I featured in this post: http://diyfunideas.com/how-to-refinish-your-counter-tops-for-only-30/) & I’m planning to use the EnviroTex for that. Hi Cindy, Thank you very much! For grout, there are two kinds: “sanded” and “unsanded.” Sanded is exactly what is sounds like, it has sand mixed in. Sanded grout is used when you’re going to have a wider space between your tiles. Unsanded grout is used usually when the tile joint is less than 1/8 inch. For the chalk paint mix, adding the grout gives the paint extra adhesion, which allows it to better stick to surfaces. Hope that explanation helps! And thanks for stopping by! I worry because I have a house full of rugged boys. Is the paint durable and does this technique scratch off easily? What protective finish do you think you will use on your kitchen cabinets. I would really love to try this but I am afraid they will end up looking shabby after awhile with use. I’ve only just finished refinishing the cabinet, so I can’t say for sure what the finish will stand up to. It hasn’t gotten a ton of use yet but the finish seems bonded pretty well and does not look like it will be scratching off anytime soon. For the kitchen I’m planning on using perhaps 2-3 coats of the polycrylic just to be safe. I would imagine that would do the trick even with a bunch of boys around. But like I said, having just finished it I don’t yet know it’s absolute limits. But will give an update down the road. You didn’t give your recipe for the chalk paint. Also, thanks for sharing, now I won’t be so shy about using a miter box. Ha, ha! You won’t know about the miter until you try! I’ve used it for other projects and never had a problem. I think it’s just that crown molding doesn’t agree with me. And yes, the chalk paint recipe is in the post (it’s in there between the 1st & 2nd images). It’s a combo of latex paint with floetrol, unsanded grout, & a little water. Awesome job! looks beautiful! pinned. found at cast party wed. Have a great week. 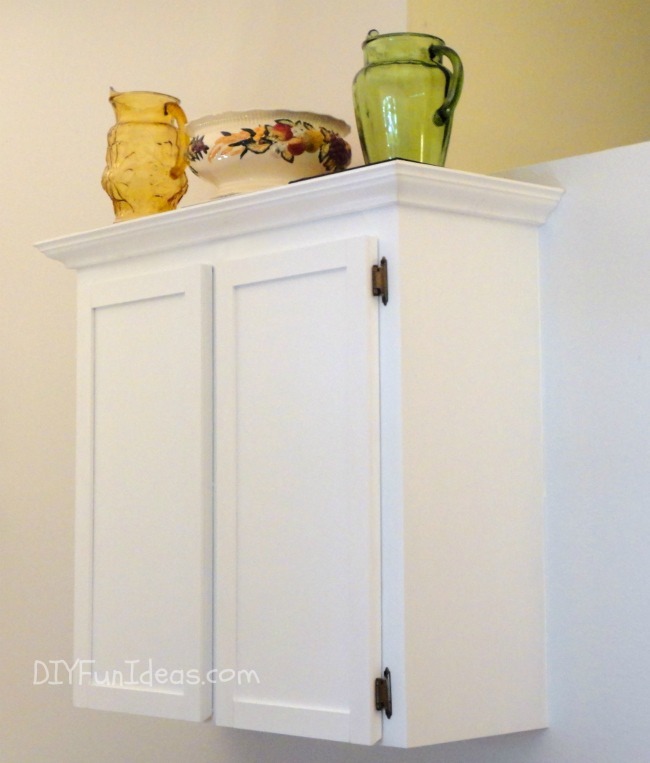 Love your cabinet makeover. Now it looks dressed up. I need to try your paint recipe. Thank you so much Beverly! It was a fun project. I have several formica cabinets I need (must!) paint, so this is a great idea. I’d never thought about Foetrol. I prefer the Plaster of Paris method, and I actually add a healthy squirt of white glue. I’m saving this post for all your tips. Geeze, I had that white formica. Wow, white glue. Does it make a big difference for adhesion? (I’m assuming that’s what it’s for) I might have to try that next because all my parents’ kitchen cabinets are the same formica and I’m planning to do them next. How much paint do you use with your squirt of white glue? Well. I’m not one who makes things complicated. All I do is to put a bunch of paint in a container, probably 2 cups? I mix in water until it’s like Yoplait yogurt. Know how runny that is? Then, I just squuuuuuueeeeeeze the glue in. If you had a full glue container, squeeze until it doesn’t come out anymore. You know, like you need to let air in? Then, I use a regular whisk to whisk in the POP until it’s the thickness of $$ chalk paint. I guess I don’t get lumps or anything because of the whisk rather than a fork, I guess. I do happen to think it helps with the adhesion. I’m not careful and can chip grout or regular POP chalk paint just by walking by a piece. Ding! Chip. It doesn’t come off as easily, but does remain really easy to sand to antique. Now I’m going to try some Floetrol. I have 2 containers of paint that are about a month old, so I’ll test it with them! Love love your pieces. Thanks for this tip! Thank you Christine! I love experimenting so I’m definitely going to give that a try! I am SO saving this recipe. Chalk paint is ridiculously expensive, I agree. I have not brought myself to make the purchase either. Thanks for sharing! Stopping by from the Craft Frenzy Friday. Great job and fantastic tutorial! I would never have believed that was the same cabinet! Thanks for sharing at Fridays Unfolded! Thank you and thanks so much for hosting!!! 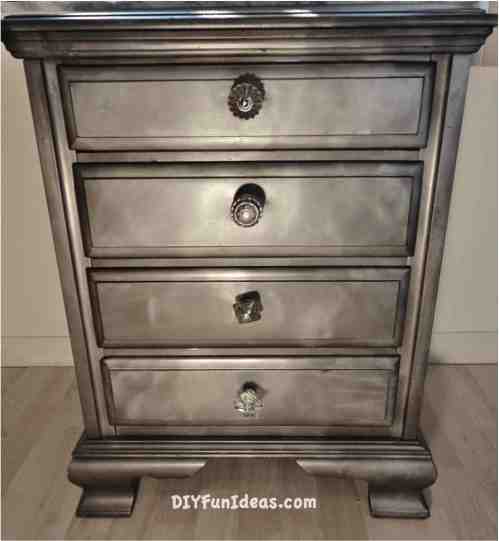 Great project – wonder if it would work on metal cabinets? Stopping by from Friendship Friday! I love what you have accomplished with this cabinet. I need to do that with one of my bath cabinets. I love making something old new also. This is great and I have found your work from Maria. Thank you so much Linda! I say go for it with your bath cabinets! Definitely. Thanks for the invite! Great tutorial! It turned out beautiful. I just wanted to let you know that I am linking to this post at Simply Creative Living on May 12th if you don’t mind. I appreciate your advice on paint. We can use it for our cabinets we are making for our basement kitchen! Thanks for linking up with us and we hope to see you next week! Sandra from Scrumptilicious4You with the Four Seasons Blog Hop. Thank you much for hosting!! Wow, what a brilliant improvement. Thanks for linking up to Sweet and Savoury Sunday, stop by and link up again. Have a great day!! I have a very creative mind and a super handy husband, so it takes a lot to wow me when it comes to renovations…but you have really WOWED me!! This is an amazing transformation! I love how you used jumper cables as clamps!! Creative, resourceful and handy with power tools…you are my idol! Awesome! Really an awesome transformation! The molding did so much! Thanks for sharing with SYC. 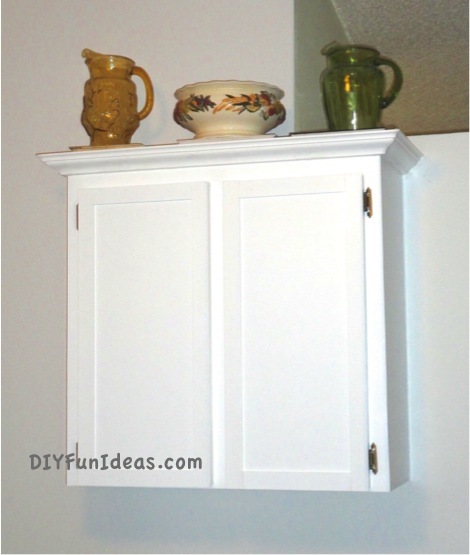 This is such a great makeover for old cabinets! Thanks so much for linking up to the Be.YOU.Tiful link party. You have such a great site! Thank you so much Jenny! And thank you for hosting! Very cool… I never new you could do that to formica. Thanks for stopping by the Boost Your FB Post hop! This is a fantastic post. I can’t believe difference between original and after, incredible. I had to pin this so I can print it out when I get some ink. Have notebook with techniques to paint, etc. We have manufactured home cabinets. The pressed wood with contact paper like covering. I’d never heard of Floetrol, where do you buy it? I’ll be using semi gloss paint that has primer in it. 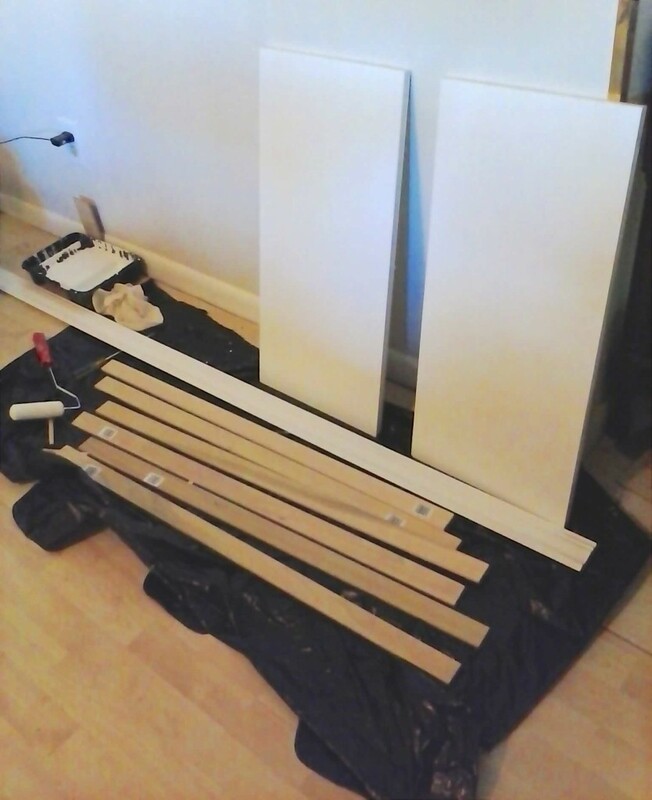 I’ve already used the paint on side of cabinet but if the Floetrol will give a nicer look than I’ll use it also. Our kitchen is right next to our living room so want it to look good. You did such an awesome job, you are very talented and have guts to try things. Good for you. I’d do better if I didn’t have somebody constantly giving out negative comments when I do things. According to hubs I can’t do anything right like he can. I just do it in different ways, he’s a “BIT of a control freak. When he’s around I get all nervous. Hi JaneEllen, You are very kind. I really like using Floetrol with anything I paint. You can get it in the paint section of any hardware store (HomeDepot, Lowes, etc.). Any sales person can point it out to you. I’m sorry to hear about the negative comments that you get. Being around that constantly can really hit hard on someone’s self esteem. What I’ve learned is that when someone puts someone else down, it’s so they can feel powerful and feel better about themselves. My ex-husband was just like that and that’s pretty much why I’m not married anymore. I hope you can let any negativity go in one ear and out the other and not let anyone ever stomp out your beautiful creativity. Hi Jenise. Fantastic job. What kind of latex paint did you use? Any particular brand? Thanks. Thanks Wanda! I believe I just used Valspar, but really I think any brand will do fine. Valspar tended to get a little thick when mixing. I’ve read that other brands don’t as much. 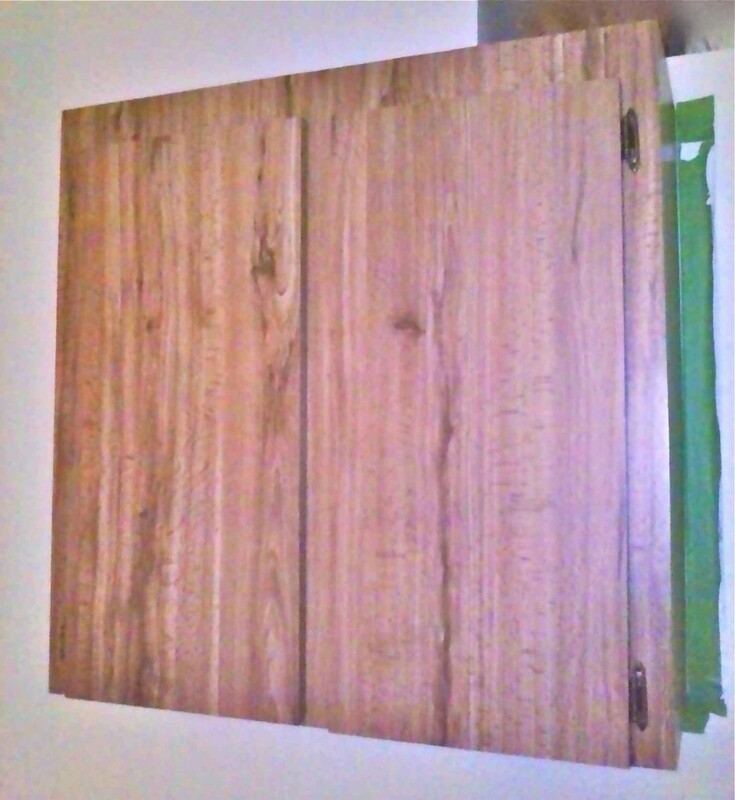 My cabinets are the cheap builder’s grade that you can peel the laminate. Yours do not look like this? Little concerned if this would work for mine…which I desperately want to paint! Hi Mary! Mine are actually the cheap stuff too where you can peel the laminate too if you tried. So you can definitely do this. Just make sure the laminate is still adhered well. I think I just found you via Pinterest! I have a quick tip you won’t believe, that helps everything adhere well, including tricycles being driven into the cabinets. Kinda like on TV. After a rough sanding, (ok, chalk paints says not, but WHY not?) add a healthy squirt of glue to your paint mixture. I use Elmer’s, craft, wood, and tightbond. I don’t care which. I find it really prevents things from being chipped off. Normal wear and tear shouldn’t affect chalk paint, but sometimes… just sometimes…. Well, give yourself a glue squirt (no, it’s not a weird kind of enema) and it’s far more durable. Oh my goodness Christine, you are hysterical!! And I have read somewhere about adding Elmer’s glue. It makes sense. 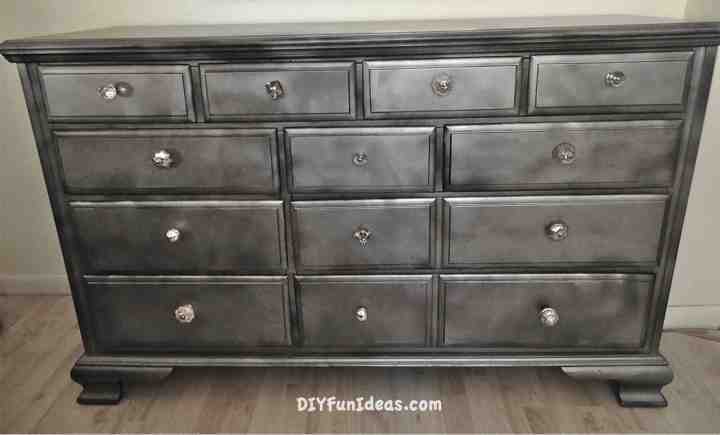 I’m definitely going to have to try it on my next chalk paint project! So now that some time has passed, are the painted countertops holding up? I’m thinking of doing this in my flower shop, where the counters get a severe beating pretty much every day! Thanks!! I think you did a fantastic job- I used to tell my x-husband that womens lib came about. because women got tired of men sitting on their behinds when a woman needed something done, so we pulled out the ol books and looked at pamphlets in stores and figured it out ourselves. ( they didn’t have internet then) Because if a woman wants something done, she will figure a way to do it-And u really pulled it off- Can’t wait to see your kitchen cabinets when done. Well – this is really weird – for the past 9 years I had a little old house in PA that I was ‘playing’ in – fixing it up – on weekends, as my retirement home later – and I ‘discovered’ that by adding not grout but about 1 tablespoon of ready-mixed spackle (drywall filler) to a gallon of paint I would get a VERY sticky, really binding paint, which was really helpful in covering bumpy old walls and set REALLY hard once dry. I used it a lot on both ceilings, walls & even some rough trim areas, and it meant I could get by with generally 1 coat of paint (great when you have a zillion older walls to paint). I didn’t know my idea was almost ‘chalk paint’ until just now – hey now I know – I will definitly try the grout mix now – thank you !!! That’s an AWESOME story! You were obviously onto something. Now I’m curious to try the spackle. I’m curious, how hard was it to get the spackle to completely mix into the paint? How are the cabinets wearing 2 years later??? Hi Deb, So far the cabinets are still in like new condition. However, these particular cabinets do get limited use. Hope that helps! 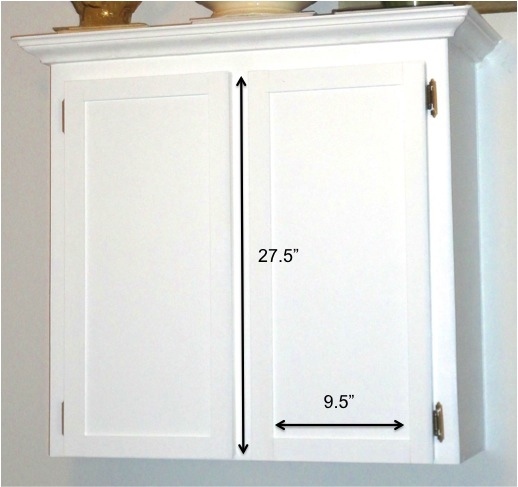 I love the trim on the cabinets, I was wondering what to do with my flat formica cabinet doors. I was thinking about removing for a no door look. I will surely tried this instead. Thanks Susan. Let me know how it goes!